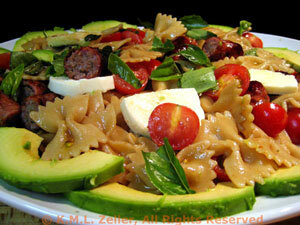 Tomato, Avocado, Mozzarella Pasta Salad, Thyme for Cooking salads. This was inspired by a Tomato, Avocado and Mozzarella salad I saw in a Williams-Sonoma cook book. I am always looking for light summer meals, so I added pasta, some chives, basil and a light vinaigrette. To round it out we grilled sausages, sliced them and added them to the pasta. You could also use ham or smoked turkey. Cook sausages on barbecue grill for 8 - 12 minutes or until done OR pan fry for same amount of time, until done. Slice mozzarella into thin slices then in cut in half. Cut avocado in half then each half in slices. Cut sausages into 1 inch slices. Add tomato, mozzarella, sausage and chives to pasta and toss lightly. In a bowl whisk the oil, a little at a time, into the vinegars. Add to pasta, tossing to combine. Arrange avocado slices around the edge of the pasts and top with basil leaves - tearing the larger ones in half. Serve. Note: You can put the pasta into a salad bowl, then arrange the avocado, or mound it in the center of a large platter, avocado slices around the edge.